Adding floor tiles to your bathroom can not only provide you with a durable, hardwearing surface, but also help you achieve your ideal bathroom vibe. Whether it’s stylish and modern, strong and bold or traditional and homely you’re looking for, at Stone Tile Company we stock a superb range of floor tiles for your bathroom that are sure to meet your needs. What is the overall aesthetic you’re going for in your bathroom? If you’re looking to keep things clean-looking and sleek, our selection of white bathroom floor tiles contains some great options for you. We have white Calacatta porcelain, white Sparkle Quartz and Aura white concrete effect options in our range. We also have warm vanilla and cream options that will help bring a definite level of comfort and peace to your bathroom space. We stock honed and filled travertine, cream porcelain, and vanilla polished options for you. If you’re looking to add a touch of bold style, black floor tiles in your bathroom do exactly that. Our black polished porcelain, brushed black slate and black Sparkle Quartz tiles are all popular selections, so consider this if you want to give your bathroom that cool edge and style. 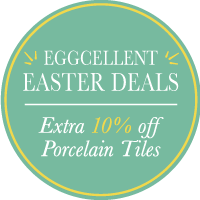 Take a look through our full range and find your ideal bathroom floor tile today. We also have handy fitting guides, tile pattern guides and general installation advice, so be sure to read up and prepare to install that touch of luxury to your bathroom with ease.